Set with two heart shaped and two smaller London Blue Topaz stones, this vibrant eternity style ring will add a splash of colour to her look. Crafted in shining argentium silver with delicate diamonds for a touch of sparkle. 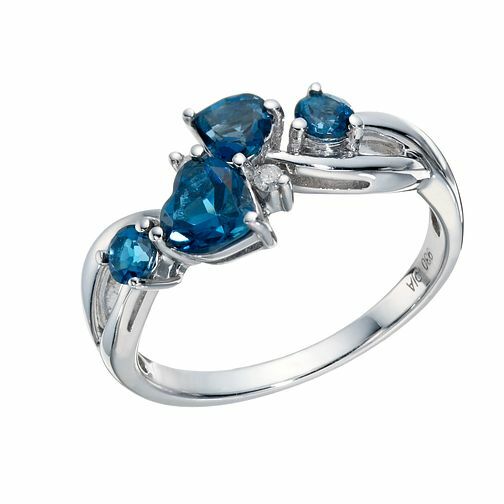 Argentium Silver London Blue Topaz & Diamond Eternity Ring is rated 4.3 out of 5 by 12. Rated 5 out of 5 by Anonymous from Excellent service Cannot fault the service I bought a beautiful green for Mother’s Day and it arrived in time and mother was a very very happy. Rated 1 out of 5 by Anonymous from Rubbish The bighearted stone fell out after less than 2 weeks of wear. The claws were faulty and one was shorter than the other.